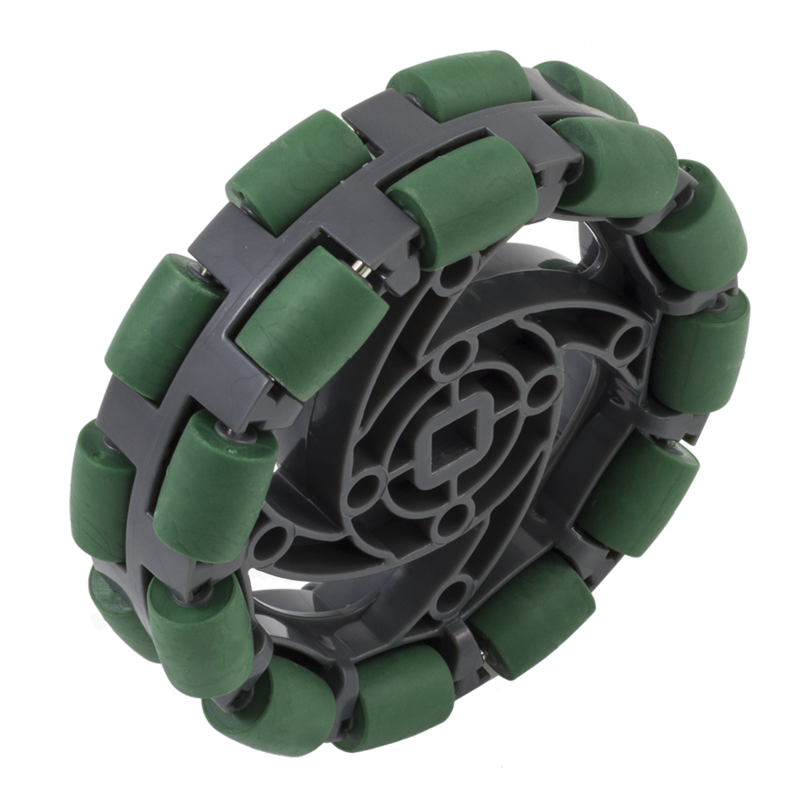 Omni-Directional or Mecanum Wheels are great for quick, lateral movements. If you need more grip, Traction Wheels offer great pushing ability and are designed for optimal grip on soft surfaces like the foam tiles used in the VEX Robotics Competition. Coming soon: More wheels will be modified to include 1/4" shaft drive and inserts for traditional 1/8" shaft. These respective product changes will roll out as we exhaust our current inventory, be sure to keep an eye out for the latest updates! As the name suggests, an Omni-Directional Wheel can travel in more than one direction. When the axle spins, it behaves like a normal wheel. However, you’ll notice that there are rollers all around the outer circumference. These rollers allow the wheel to travel sideways as well! Shown above, 3.25" Omni-Directional Wheels include removable wheel inserts that allow for additional versatility. Use these wheels with either standard Drive Shafts or High Strength Shafts, in either a driven or free spinning application. For additional information about Omni-Directional Wheels, click here. Traction Wheels are designed for optimal grip on soft surfaces like the foam tiles used in the VEX Robotics Competition. Removing the tread of the 2.75" wheel reveals a low-friction wheel that can be used for other purposes. Removing the tread of the 4" and 5" wheels reveals a ribbed plastic wheel. Shown above, 3.25" Traction Wheels include removable wheel inserts that allow for additional versatility. Use these wheels with either standard Drive Shafts or High Strength Shafts, in either a driven or free spinning application. For additional information about traction and friction, click here. 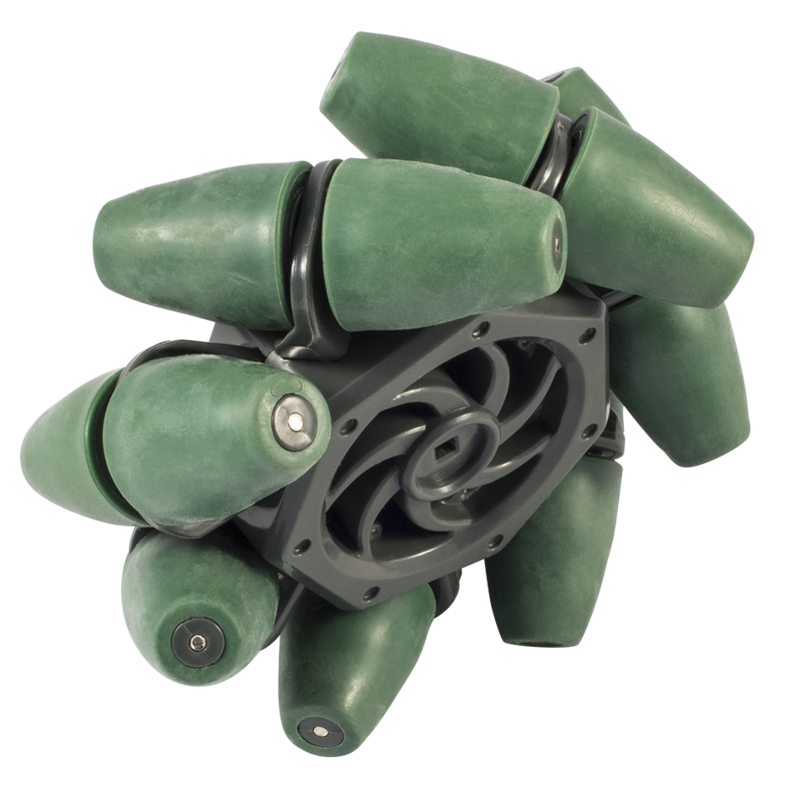 Mecanum Wheels allow savvy robot designers to create drivetrains capable of moving in any direction using a standard chassis shape. Simply power each wheel with a different motor - by changing the directions the wheels spin, you can even make your robot move sideways! 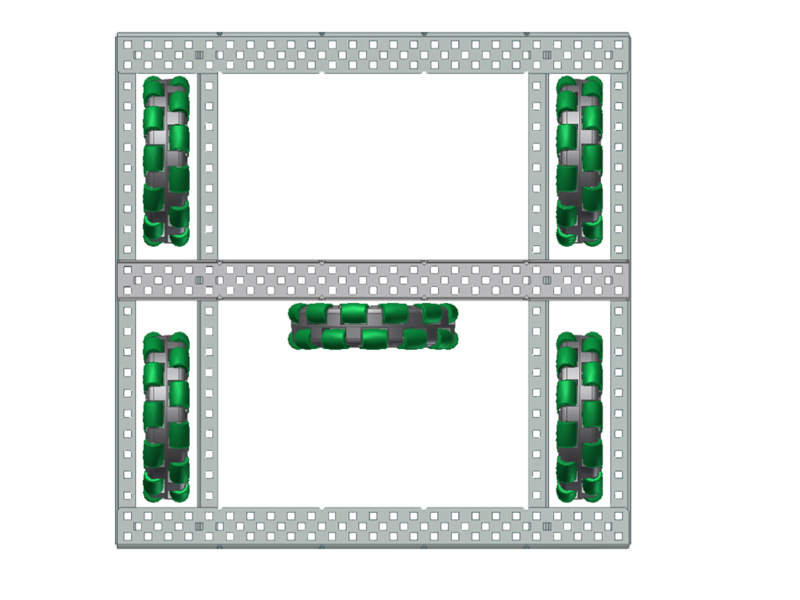 Note: The orientation of wheels is vital when creating a Mecanum drive. Be sure that the left and right wheels are placed accordingly, and facing the right direction. See the diagram below for a correct example. Create robots capable of climbing over almost any obstacle. Wheel Legs are great for constructing All-Terrain or Off-Road robots. 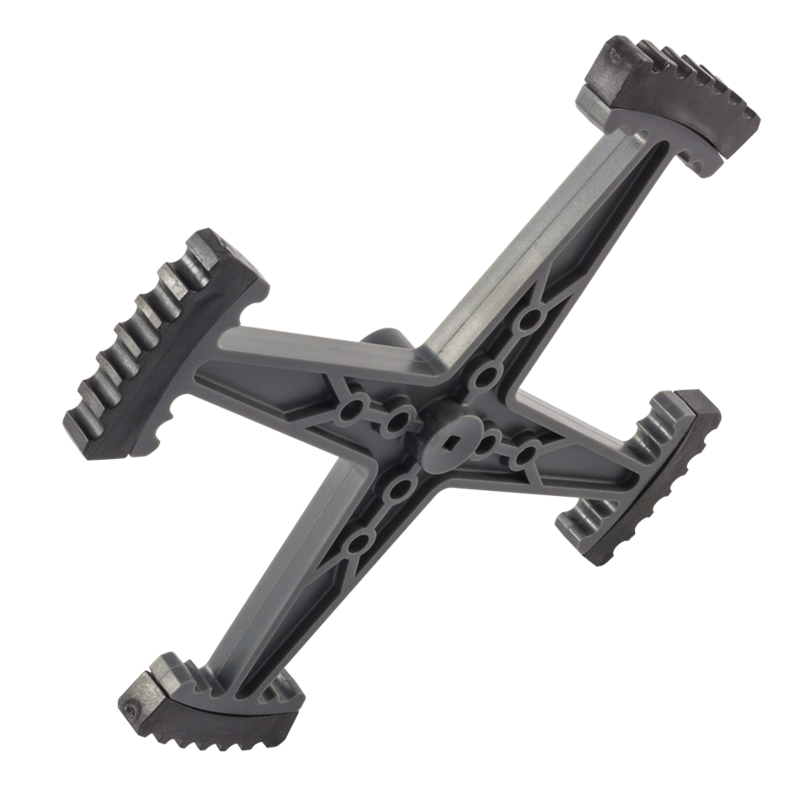 These legs consist of (4) spoke "legs" protruding from a central hub with mounting holes for attaching mechanisms. They also have high traction rubber feet and an offset hub for "overlapping" wheels. Note: Wheel rims not included. 2.75" Double-Roller and 4" Omni-Directional Wheels are compatible with 0.125" square bar drive shafts. 2.75", 4" and 5" Traction Wheels are compatible with 0.125" square bar drive shafts. Use with 4" VEX wheels. 4" Mecanum Wheels are compatible with 0.125"(3.2mm) square bar drive shafts. 6" Wheel Legs are compatible with 0.125"(3.2mm) square bar drive shafts.